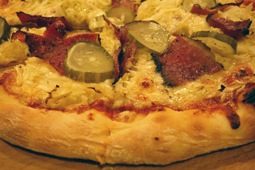 Reuben Pizza - A recipe from Savor California, the online showcase for extraordinary gourmet foods and beverages from California. Combine sauces, salt, pepper, and brown sugar in a small sauce pan. Heat until all ingredients are dissolved and well combined. Roll out pizza dough to 14" diameter. Top with sauce. Spread cheese evenly over pizza. Top with sauerkraut, then pastrami, and finally the pickle slices. Bake in the hottest setting of your oven for 10 minutes.